Adding to BLDGBLOG’s earlier photographs of the Mirny Mine, here is one more – in a highly suspect color scheme – as pointed out to me by Anonymous. 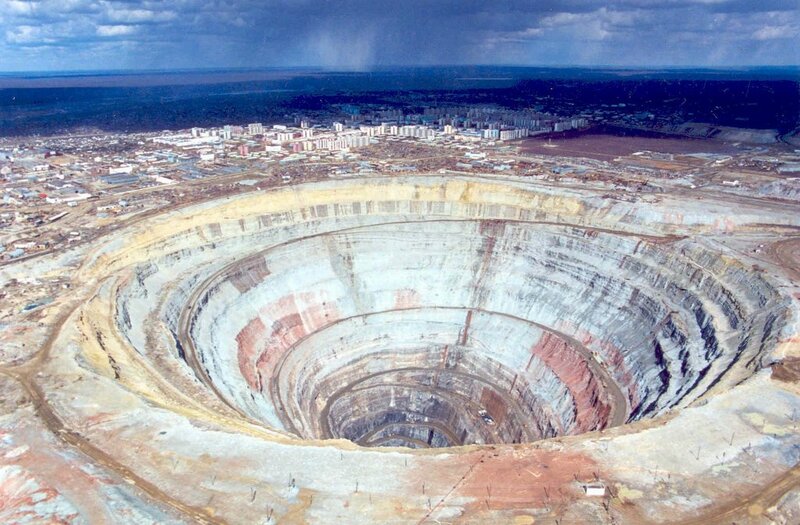 – which also reveals the rather astonishing difference in scale between the city and the hole itself, which, of course, is the world’s largest diamond mine. 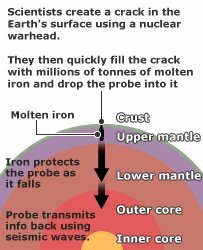 The photograph, meanwhile, reminded me of something my friend Dan once told me, that an American scientist had devised a plan to use, yes, nuclear bombs to open up a hole in the earth’s crust. Nuclear bombs. Surely, then, it would be worth nuking a self-propagating crack into the earth’s crust? What could possibly go wrong? Turns out he’s kidding – sort of. (See PDF).